Say you’ve added an employees table in the VintageDatabase file and inserted these records in it. Now, you want to delete the third record from the employees table. To do that, you’d have to prepare, bind, execute, and finalize this sqlStatement. If you didn’t specify a WHERE clause in the sqlStatement, all records in the employees table will be deleted. When you write a DELETE query, make sure you set up the WHERE condition correctly to avoid lose of vital data. In order for the operator to delete a row from the view’s Table View control and the database’s possessions table, you’ll have to execute steps laid out below. Declare and implement this method in the AppDelegate class, which delete a record from the database’s possessions table. //2. 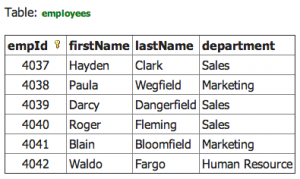 Bind the method's parameter value to the sqlStatement's placeholder ? You need to add code shown below in the MasterViewController.m file’s commitEditingStyle: method. Run the application. 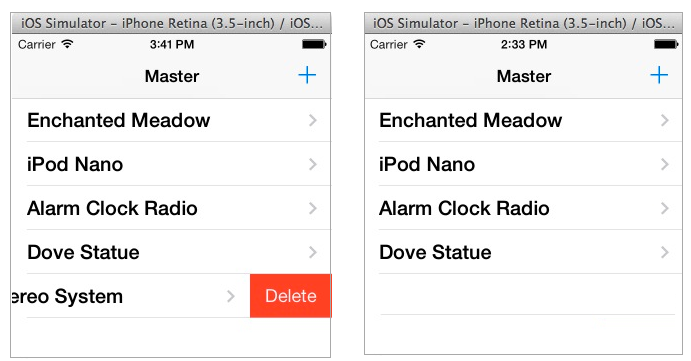 Once you see the Master View screen in the simulator (first image below), swipe the last row to put the Table View in edit mode, then click the ‘Delete’ button. The system respond by executing code you placed in the commitEditingStyle: method, resulting in output shown in the second image below. The next time you run the application, the row (Mini Stereo System) will not appear in the Table View control. That’s because you added code in the commitEditingStyle: method to implement this operation: Delete a record from the database and the views Table View control. By the way, the Table View control’s data source object (itemsOwned) contain four elements, which are instances of the Item class, as shown in the image below. The array the system deleted from the itemsOwned array is highlighted in blue. That’s the end of this week’s workshop. In it, you learned how to delete rows from the database file and the Master View’s Table View control. Next week, you will learn about three types of JOIN queries the SQLite engine support.